Astronomers using the European Space Agency’s Herschel Space Observatory have discovered a new way of finding cosmic zoom lenses, which allow astronomers to peer at galaxies in the distant Universe. The magnification allows astronomers to see galaxies otherwise hidden from us when the Universe was only a few billion years old. This provides key insights into how galaxies have changed over the history of the cosmos. Herschel looks at far-infrared light, which is emitted not by stars, but by the gas and dust from which they form. Every schoolchild is taught that light travels in straight lines – but a century ago Albert Einstein showed that gravity can cause light to bend. The effect is normally extremely small, and it is only when light passes close to a very massive object such as a galaxy containing hundreds of billions of stars that the results become easily noticeable. When light from a very distant object passes a galaxy much closer to us, its path can be bent in such a way that the image of the distant galaxy is magnified and distorted. These alignment events are called “gravitational lenses” and many have been discovered over recent decades, mainly at visible and radio wavelengths. As with a normal glass lens the alignment is crucial, requiring the position of the lens – in this case a galaxy – to be just right. This is very rare and astronomers have to rely on chance alignments, often involving sifting through large amounts of data from telescopes. Most methods of searching for gravitational lenses have a very poor success rate with fewer than one in ten candidates typically being found to be real. Herschel’s panoramic imaging cameras have allowed astronomers to find examples of these lenses by scanning large areas of the sky in far-infrared and sub-millimetre light. These results are from the very first data taken as part of the “Herschel-ATLAS” project, the largest imaging survey conducted so far with Herschel, and are published in the prestigious scientific journal Science. Dr Mattia Negrello, of the Open University and lead researcher of the study, explained, "Our survey of the sky looks for sources of sub-millimetre light. The big breakthrough is that we have discovered that many of the brightest sources are being magnified by lenses, which means that we no longer have to rely on the rather inefficient methods of finding lenses which are used at visible and radio wavelengths." The Herschel-ATLAS images contain thousands of galaxies, most so far away that the light has taken billions of years to reach us. Dr Negrello and his team investigated five surprisingly bright objects in this small patch of sky. Looking at the positions of these bright objects with optical telescopes on the Earth, they found galaxies that would not normally be bright at the far-infrared wavelengths observed by Herschel. This led them to suspect that the galaxies seen in visible light might be gravitational lenses magnifying much more distant galaxies seen by Herschel. This shows the effect of gravitational lensing as seen by Herschel and ground-based telescopes. 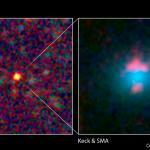 The light from a distant galaxy (red), is warped and magnified by the presence of a foreground galaxy (blue). This makes the distant galaxy appear much brighter, seen by Herschel as the orange dot in the upper-most panels. The lensing also distorts the image observed by the Submillimeter Array (SMA), shown here in pink. The foreground galaxy is not seen by Herschel, but is observed by optical telescopes such as the W. M. Keck Observatory on Hawaii, shown in blue. The light from the distant galaxy has been travelling for 11 billion years, allowing astronomers to observe the precursors to galaxies like our own in the very early Universe. The effect of the gravitational lensing can be used to work out the structure of both galaxies, probing the formation of stars and galaxies billions of years ago and the role of mysterious Dark Matter in the relatively nearby Universe. The magnification provided by these cosmic zoom lenses allows astronomers to study much fainter galaxies, and in more detail than would otherwise be possible. They are the key to understanding how the building blocks of the Universe have changed since they were in their infancy. Professor Rob Ivison of the Royal Observatory, Edinburgh, part of the team that created the images, said “This relatively simple technique promises to unlock the secrets of how galaxies like our Milky Way formed and evolved. Not only does the lensing allow us to find them very efficiently, but it helps us peer within them to figure out how the individual pieces of the jigsaw came together, back in the mists of time”. Dr Loretta Dunne of Nottingham University and joint-leader of the Herschel-ATLAS survey said, “What we’ve seen so far is just the tip of the iceberg. Wide area surveys are essential for finding these rare events and since Herschel has only covered one thirtieth of the entire Herschel-ATLAS area so far, we expect to discover hundreds of lenses once we have all the data. Once found, we can probe the early Universe on the same physical scales as we can in galaxies next door."